Ready to Serve - YUM! With Easter Sunday coming up within the next few days, I have been brain storming what side dish I will be making for Easter dinner. My fiancé and I love inviting family and friends over to have a nice evening filled with loved ones and good food. After searching Pinterest for some ideas, I decided to make roasted sweet potatoes for our main side dish, which will go perfectly with our tradition of serving ham and turkey – you can never go wrong with both! Pre-heat oven to 350 degrees. Place sweet potato cubes onto a baking sheet. 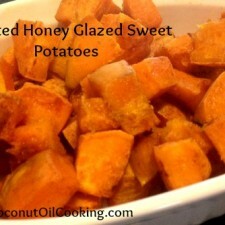 Drizzle on melted coconut oil, honey, cinnamon, salt, and pepper over the sweet potatoes. Roast for 35-45 minutes, or until sweet potatoes are tender. Take sweet potatoes from the oven and transfer them to a dish or serving platter. Drizzle with extra coconut oil if desired and sprinkle any additional cinnamon on top for decoration. These sweet potatoes turned out amazing and will be the perfect side dish for Easter dinner. 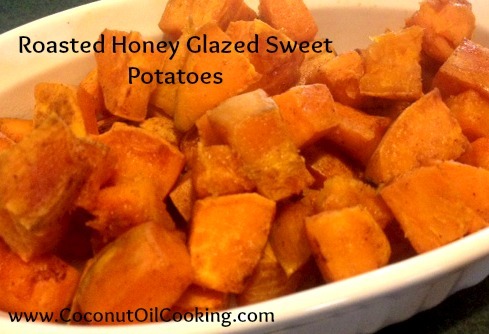 The coconut oil and honey mixture compliments the sweet potatoes so well – you won’t be disappointed! For more Easter ideas, be sure to visit our Top 5 Favorite Easter Recipes.